It’s not hyperbolic to suggest that how the next two months play out could be franchise-altering for the Winnipeg Jets. With quite possibly their two most important players both facing uncertain futures with the organization this summer, what the team looks like in the years to come will surely be shaped by the direction they choose to head in. As such, it goes without saying that Kevin Cheveldayoff and his staff need to approach all of their personnel decisions with the utmost care. Especially in the case of Dustin Byfuglien, who seems less likely of the two to be rewarded with the big contract he’s looking for if the rumblings are any indication. All of which presents a rather interesting dilemma to keep an eye on as the February 29th trade deadline approaches. It isn’t often that players possessing Dustin Byfuglien’s instantaneous game changing ability are made available. In terms of recent precedent, there aren’t very many comparables to draw from. Players like Keith Yandle, Jay Bouwmeester, Alex Goligoski, James Wisniewski, Andrej Sekera, and Cody Franson have been moved in-season to a contender but none of those players were at the level Byfuglien is currently at. Still, all of those aforementioned players wound up netting the team moving them at least a couple of worthwhile assets. If history has taught us anything, it’s that there’s a shortage of defensemen and teams in the hunt will pay for them. The Jets shouldn’t be short of interested suitors lining up for his services. A swath of teams will be excluded from the discussion either because of their geographical proximity to the Jets, or because of insufficient resources to make a reasonable deal happen, but I imagine there’s over a handful of Eastern Conference teams that would jump through hoops for a chance to plug him into their lineup. Justifiably so. Byfuglien truly is one of the few unique specimens in a league filled with a growing number of players that look the same, and play the same. It’s one thing that he’s a big body, but far more importantly than that, he knows how to use it in a devastating manner while not taking other things off of the table. The things he’s able to do at his size with both his feet and his hands is what makes him the wildly successful that he is. Since being moved to the blueline, only Brent Burns, Erik Karlsson, Victor Hedman, and John Klingberg have produced points at a more efficient rate than him. 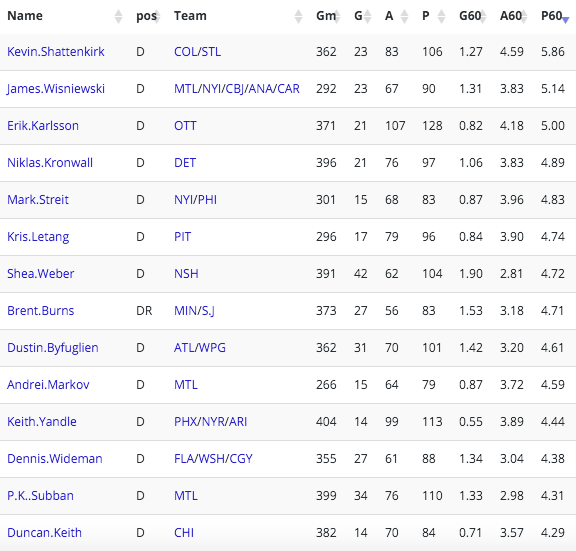 Only Burns – who spent a significant chunk of time playing on the wing of one of the league’s most lethal playmakers – and Karlsson have more goals in that span of time, and only the two of those guys plus Keith Yandle have more points. He’s driven play on top of that, with his 52.7% score-adjusted possession rate and +3.9% relative rate to his team amongst the very high end of defenders. His effectiveness has stretched to the power play, where he’s been one of the league’s most lethal players from the point. The combination of his offensive instincts and his shot has resulted in only Shea Weber and PK Subban scoring more goals from there. At this point his offensive exploits and accomplishments aren’t a secret by any means, but his ability to contribute on the penalty kill is something that’s been overlooked. Particularly this season, in which he’s been a successful shot suppressor. Some of that is influenced by that being a relative metric that’s skewed by Winnipeg having been atrocious while down a man otherwise, but the point is well taken regardless. He’s an immensely impactful player from the back-end made even more desirable as an asset when accounting for a free agent crop that’s devoid of many peers rivalling his abilities. 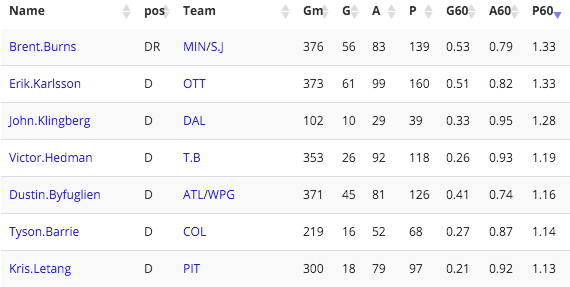 Considering what highly-regarded defensemen are going for these days, if the figures regarding his asking price are accurate having Dustin Byfuglien come in at under a $7M tag on your cap is of substantial value. His demands are completely within reason. I think there’s some merit to being concerned about how he’ll hold up in the back-half of that deal given the age, miles, and wear-and-tear he puts on his frame on a nightly basis. Striking a fine balance between winning now and keep an eye out for the future is certainly important. But in this particular case, this seems like a situation where you put off crossing that bridge down the road when the time comes, instead prioritizing ensuring that a player which’ll help you keep your job in the meantime is producing for your team. Especially considering we’ve yet to really see any legitimate warning signs suggesting he’s due for an impeding atrophy in effectiveness anytime soon. All of which makes the decision to part ways with him that much more difficult for the Jets. In an ideal world, they’d bring the entire crew back and supplement it with an incoming group of highly intriguing prospects to try and help put them over the top. Unfortunately it’s not that simple. When you’re a team that needs to be managed with an internal budget in mind, lines in the sand need to be drawn. Assuming that they’ve already chosen Ladd based on a combination of factors, and have to pony up for massive raises going to Trouba and Scheifele, that makes Byfuglien a casualty. If that really is the case, winding up with nothing to show for him after this summer immediately becomes a fireable offence. While the Jets are a competitive team that could conceivably make a spirited run for a second straight season, they’d be prudent to take a step back and evaluate not only themselves but the landscape in an objective manner. They’re playing in a nightmare of a division, and even if they managed to squeeze their way into the playoffs the idea of them running the Central gauntlet seems farfetched. The situation Kevin Cheveldayoff faces surely isn’t an enviable one. After all of the momentum and good will they built up with their fans following last season, moving one of your best, most exciting players for a handful of assets that’ll set the clock back a little bit seems like taking two steps back after having taken one step forward. While they be one of a few teams capable of filling the gargantuan hole left by a player of Byfuglien’s magnitude with the internal blueline pieces they possess, it’d be silly to suggest that the loss wouldn’t be felt in a multitude of ways. They may have no other choice, though. The alternative of rolling the dice and letting him walk this summer as a free agent would ultimately set them back as an organization that much further. The main problem with re-signing Buff is that we should be signing him for 20 years but can only do 8 years because of NHL red tape. Buff is awesome. While Buff is a impact player, he certainly won’t be as he reaches his mid 30’s. Buff has 2 or 3 good years left before his style of play wears him down. The Jets would be fools to offer more than 3 years to Buff. Let me guess: 3 years at 7.5 million per. Does Buff get a donation receipt for the rest or just get to feel nice? Even as Buff declines he will still have value. When he stops being a top-pair impact defenceman he’ll be a top-4 defenceman. He’ll always have that shot. The fear is that he slows down in 2 years or blows out a knee. Same for Ladd or anyone else, too. Biggest knock against Buff is mental mistakes. He could get smarter, too. Right now Buff is worth 9 million a year. Maybe more. Jets get surplus value for the first few years and give some back on the back end of the deal. Totally okay by my books. The only upcoming Jets player who has earned a a huge raise is Scheifele in my view (so far this season). Trouba should bridge a deal if this is not doable I’d trade him, as he will have the best return, I think the hype far exceeds the deliverables to date with JT, ultimately though I hope that he stays a while.